The mouth is the first part of the digestive system. However, textbooks / descriptions vary with some mentioning the teeth as the first part of the digestive system. When studying anatomy it is useful to be able to describe parts of the body using a diagram, e.g. to answer questions such as: "Describe the features of the mouth with the aid of a diagram." A very simple labelled diagram of the mouth (anterior view of the mouth) is shown below, followed by notes about each of the structures labelled. This is useful for introductory level courses but doesn't include all of the parts of the mouth that are involved in the initial stages of the digestion process. the epiglottis (which prevents food from entering the larynx - at the upper-part of the respiratory system). Click the text labels on the diagram for information about the part of the oral cavity indicated by the label. The mouth includes both soft tissues (such as the tongue, soft palate and tonsils) and hard structures (including the teeth and jaw bones into which the teeth are set). The outer structures of the mouth are the cheeks on the outside of the the oral cavity and the upper- and lower- lips which are facial structures that close the oral cavity when rested together such that the lower surface of the upper-lip is in contact with the upper surface of the lower-lip. The lips are prominent features of the face and therefore an important topic in the subjects of beauty incl. cosmetic surgery. The mouth (or "oral cavity") is important for speech and communication, eating and digestion, and can also be used for breathing. The main structures inside the mouth are the teeth, tongue, tonsils, salivary glands and - at the back of the throat (not shown on the left). the epiglottis. See also more about teeth. The lips are fleshy folds of tissue around the opening of the mouth - covered with skin on the outside and a mucous membrane on the inside. The upper-lip is also known as the superior lip and is the lip closest to the nose (as opposed to closest to the chin). The lips are fleshy folds of tissue around the opening of the mouth - covered with skin on the outside and a mucous membrane on the inside. The lower-lip is also known as the inferior lip and is the lip closest to the chin (as opposed to closest to the nose). The hard palate extends over most of the roof of the mouth. The solid structure of the hard palate is formed by the maxillae and palatine bones. The soft palate is located posterior to the hard palate and consists mainly of muscle tissue. The uvula is a projection of soft tissue that hangs, some texts say "dangles", from the soft palate and moves upwards with the soft palate during swallowing. This prevents the food and/or liquid that is being swallowed from passing into the nasal cavity. The tonsils consist of lymphoid tissue and are part of the immune system. 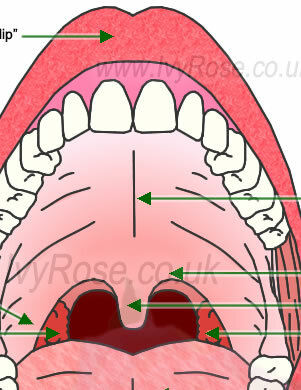 There are three sets of tonsils in the oral cavity, the lingual tonsils towards the back of the tongue, the palatine tonsils shown in the diagram above and the pharyngeal tonsil in the pharynx. The tongue is a thick muscular organ that forms the floor of the mouth (= "oral cavity"). It consists of skeletal muscle covered with muscous membrane. The tongue also includes many taste buds - each of which consists of three types of epithelial cells: supporting cells, gustatory cells and basal cells. Some school biology courses include lessons about the zones of taste buds on tongue. The sockets of the teeth (see below) are covered by dense fibrous connective tissue anchoring the teeth to the appropriate jaw bone (upper jaw bones = maxillae; lower jaw bone = mandible), keeping them in position and acting as a shock-absorber to cushion the impact of the teeth on the bones during active crunching actions. Teeth - Very brief notes about the teeth labelled in the diagram above. For more info see teeth and the digestive process. Incisors are teeth that are located at the front and mid-line of the mouth. They are relatively flat or "chisel-shaped" and suited for cutting into food. Canine teeth are also known as cuspids (a useful term to avoid confusion with the use of the word "canine" to refer to dogs). They have a single pointed surface called a "cusp" which is adapted for tearing and shredding food. Premolars are also known as bicuspids. They are teeth that have two cusps with which to crush and grind food. They are located between the cuspids and the molars, as shown above. Premolar teeth generally have either one or two roots. Molars are teeth that have three or four blunt cusps with which to crush and grind food. They are located at the back of the mouth (oral cavity). Molar teeth generally have two roots or three roots, two in the case of the molars in the lower-jaw and three in the case of the molars of the upper-jaw. These are not the only structures in the mouth. This is information about the simple parts of the mouth shown in the anterior view above. The numbers included above are for ease of reference only. The order in which the parts of the mouth are listed has no significance. Only short simple notes are included here. For more about the structures of the mouth click the (pink) links for further details - link to another page. Next see the page about the teeth and their role in digestion.